Our ensemble is built on the principles of providing quality live music in an enjoyable way and at an affordable price. We have been performing at prestigious venues in the East Kent area for over two decades, with a wide variety of talented musicians (see Players page). We pride ourselves on our flexibility: the word Impromptu means 'in readiness' and we try to be ready for anything. Yes, we've experienced a violin string snapping in the middle of a piece... just refinger and keep playing. A cello string snapped while we were tuning up for an extravagant party performance... let's just say our record for changing a cello string is now under four minutes! A banker married a call centre girl and wanted something special... so we arranged a piece incorporating well-known musical references to money and telephones. 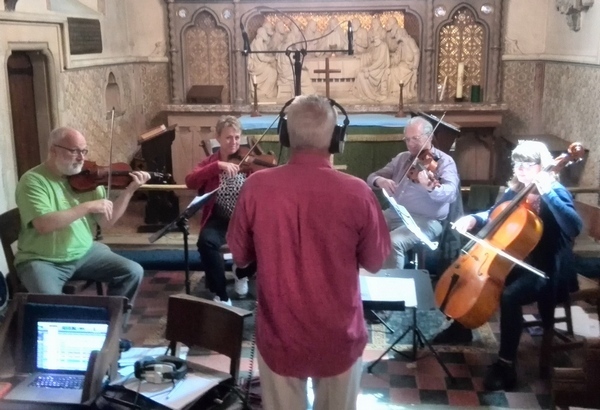 A couple were spending their honeymoon in the Caribbean... and who'd have thought it, calypso and reggae do work well as string quartets. A bridegroom wanted something unusual, and let slip that the wedding's colour theme was a deep shade of purple... so he found himself entering to our arrangement of Deep Purple's Smoke on the Water, and loved it. Whether your budget only stretches to a solo instrumentalist, or if you're splashing out and really want a whole orchestra, we'll do our best to accommodate your requests. We are quite open to spontaneous suggestions - and have even done an entire classical concert based on requests shouted out by the audience, including some pieces we'd only bought that morning and were therefore sight-reading - but that's of course only possible with top quality, well practised professional players. If it turns out that what you really want is a band of improvising, extemporizing, ad-libbing jazz musicians... we can even help out on that score. Recording some tracks with Dave White for one of the Railway Swing Band CDs.